As a reminder the consensus was for the Conservatives to win just 270 seats, where even the BBC's exit poll AFTER the polls closed at 10pm proved WRONG by forecasting the Conservatives would FAIL to win an outright majority on 316. Instead, the reality proved to be the exact opposite as instead of the Ed Milliband walking into No 10 we had David Cameron racing back to No 10 before the locks were changed and where this video explained in detail why the opinion pollsters got the UK general election 2015 so badly wrong which was contrary to my long-standing expectations for a probable Conservative outright election win. 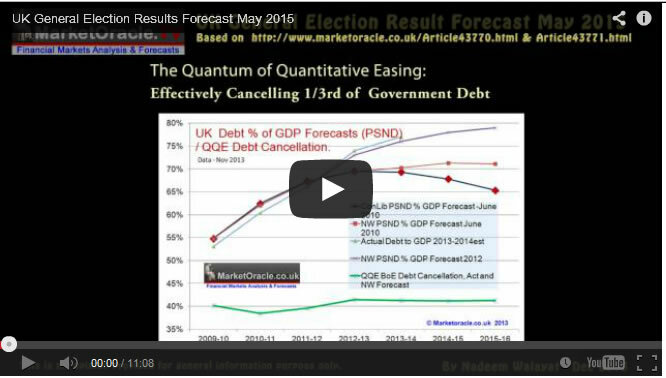 As the following video illustrates the final house prices momentum data analysis just prior to the election on the 1st of May 2015 fine tuned the forecast to the Tories winning a single digits majority, against the actual outcome of an 10 seat majority that no one saw coming, as even after the polls closed the BBC's exit poll predicted a hung parliament. 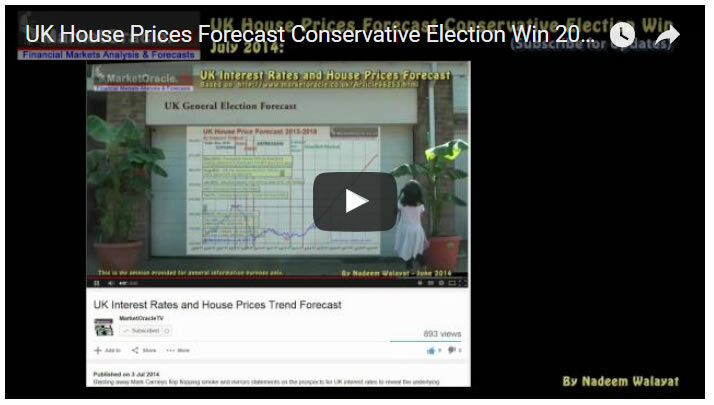 Therefore in this unique analysis representing a complete departure from the polls based nonsense I will take a look at what my house prices 5 year trend forecast and momentum analysis predicts for outcome of this general election. The most recent UK average house prices data for April 2017 (£219,649), has house prices effectively flat lining for the first 4 months of this year, showing a 8% deviation against the forecast trend trajectory, which if it continues to persist then in terms of the long-term trend forecast for a +55% rise in average UK house prices by the end of 2018 would then translate into a 11.4% reduction in the forecast outcome to approx a +44% rise by the end of 2018. I will take a detailed look at the prospects for UK house prices after the UK General Election. UK house price momentum has been steadily falling since Mid 2016, falling to the current low of just +2.6% in the wake of BrExit uncertainty after a brief rally into December 2016 towards 7%. Whilst there are no signs of recovery given the uncertainty of the general election. Nevertheless summer months tend to be the best months for UK house price inflation and so the momentum graph should be bottoming out around the time of the election. In terms of the forecast outcome, then it would have been marginally better to have the May house prices data which unfortunately won't be released until the 7th of June. However, indications from other indices such as Nationwide are that house prices were little changed for May. The key drivers of the house prices positive or negative wealth effect in this election are UK house prices over the following time periods. The weighted average is in favour of the most recent data as having the most impact on voter behaviour. Considering the 2 key UK house price momentum averages gong into the election of +2.6% for the year to date and +5.4% for the weighted average. Then these are net positives for the incumbent party i.e. 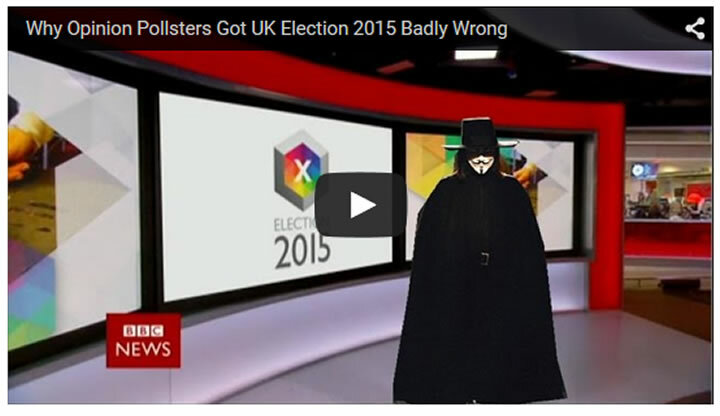 the Conservative government 'should' increase its seats majority. However, house price momentum is FALLING so over the passage of time since the EU referendum the potential size of the increase in the Conservative majority has been gradually eroding i.e. it would have been much better for Theresa May to have called the election 6 months ago for say December or January when house prices momentum was rising towards 7% rather than for June 2017. So the decline in house price momentum will result in a significant reduction in the size of the Conservative majority that will likely be nowhere near the likes of the 400+ seats that many in the mainstream press were bandying about just a couple of weeks ago! Therefore UK house prices momentum is forecasting barely a dozen seat increase the Conservatives seats total from 330 to about 342 seats that converts into a Commons majority of 34, which again is a far cry from the 100+ seat majority that some still persist on. So whilst it would have been much better for the Tories to have gone to the polls 6 months earlier when they could have achieved an majority of near 100 seats. However, given the current house prices trend trajectory then waiting another 6 months could have resulted in a hung parliament with a probable Labour - SNP Nightmare Coalition. So it looks like an overly cautious Theresa May has played it a little too safe by not going to the polls earlier, but still did not make the same mistake as Gordon Brown when he bottled out of calling a 2007 general election. 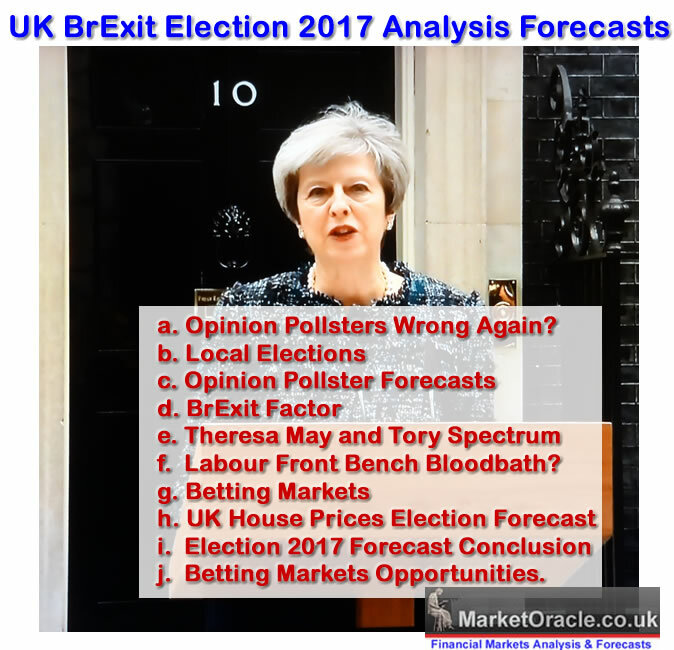 This is my last sub analysis in my BrExit General Election series ahead of my final forecast conclusion that pulls all of the disparate threads together to form a seats per party forecast. So ensure you are subscribed to my always free newsletter for this concluding analysis and to our youtube channel for videos in this and the BrExit War series.